When I first received The Noma Guide to Fermentation, I didn’t think there would be anything that I could make from it. I’ve seen the restaurant’s new fermentation lab in Copenhagen, and it is 2001: A Koji Odyssey. 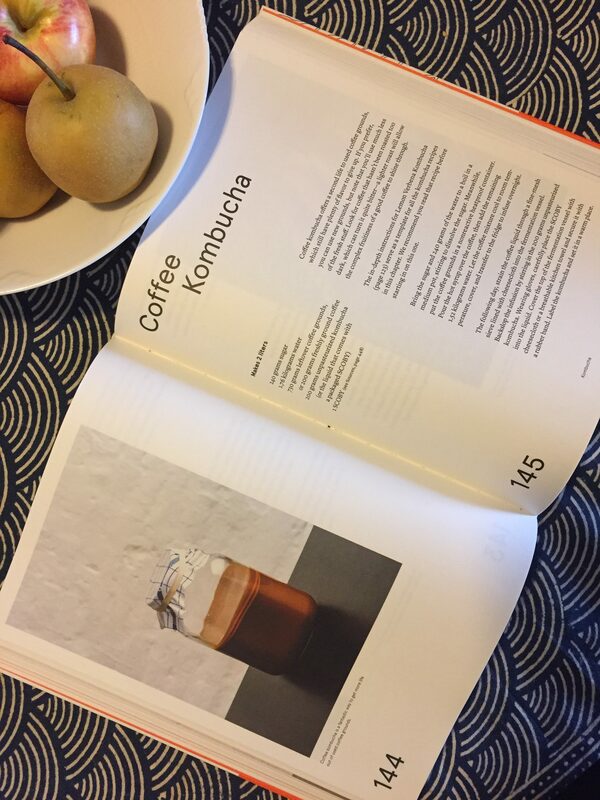 But the first recipes in the book are for kombucha, something that I’ve been making at home for years (it’s cheap! It makes me feel good! I swear it makes my skin and eyes clearer!) and want to get better at. 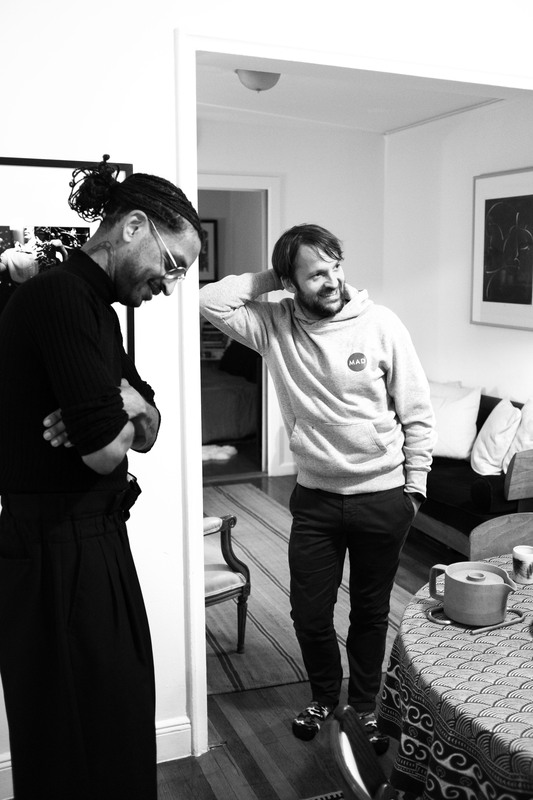 So when Noma chef René Redzepi and David Zilber, the head of Noma’s fermentation lab, were in town for their book tour, I asked them to stop by and show me how to make coffee kombucha — after which I thought I’d ask them to taste what I’ve got brewing under my sink. Okay. To the coffee kombucha. I had tasted a version made with leftover drip coffee at Copenhagen’s Coffee Collective, and I loved the lemony acidity that the fermentation imparted. I was eager to try it at home. 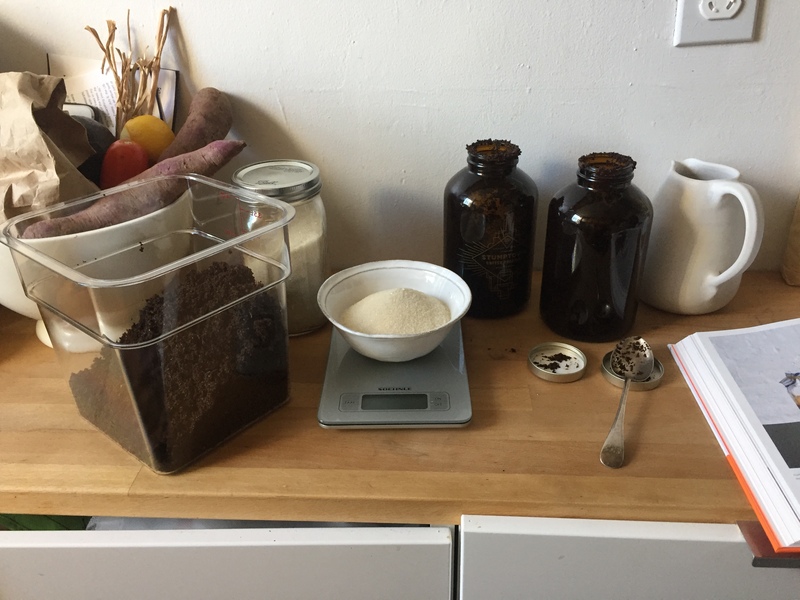 To make the Noma recipe with the guys, I asked the folks at Stumptown to give me 750 grams of used grounds, which they were surprisingly cool about doing. My kind of composting! “Is it light roast?” asked Redzepi, who favors the Scandinavian style of coffee. 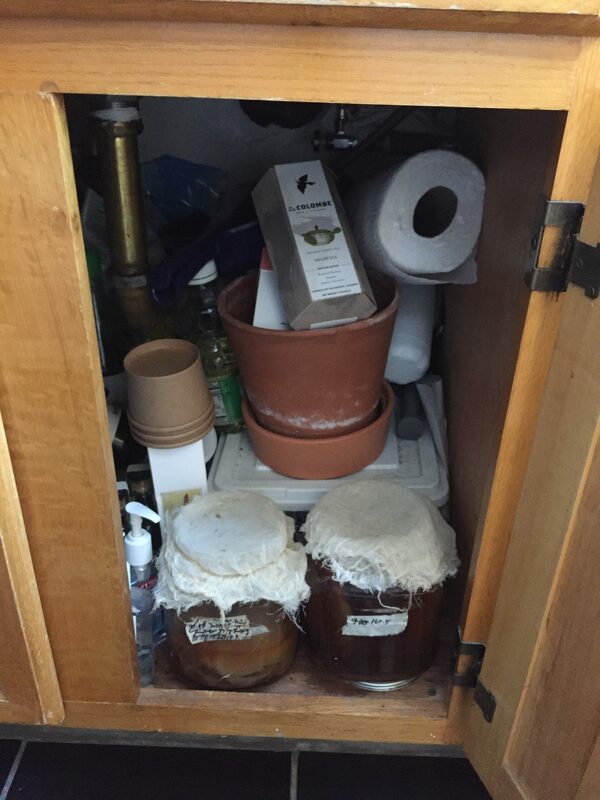 Hey Noma, can I come intern in your fermentation lab? Suddenly, my apartment was chaotic. Redzepi’s wife, the cookbook author Nadine, had arrived — they were headed to the airport soon. Then the Superiority Burger that I’d ordered arrived. Next, my ex brought my son back from soccer. With the coffee and sugar syrup ready to infuse in the fridge overnight, I wanted some honest feedback on the kombucha I’d just finished brewing. Redzepi had already spooked me by saying that he thought most commercial kombuchas are horribly vinegary. “There’s no fruitiness or freshness anymore. Me and David have very strong opinions on this.” Zilber nodded. He, too, only drinks at the office. David: This is delicious. This is a perfect kombucha. René: This is the good stuff. René: This is refreshing. That’s the moment when I like them. Emboldened, I showed them the very scary setup under the sink. Let’s just say that it’s obvious that I don’t wash my jars every time I make a batch. “As a chef, this is really freaking me out,” said Zilber. 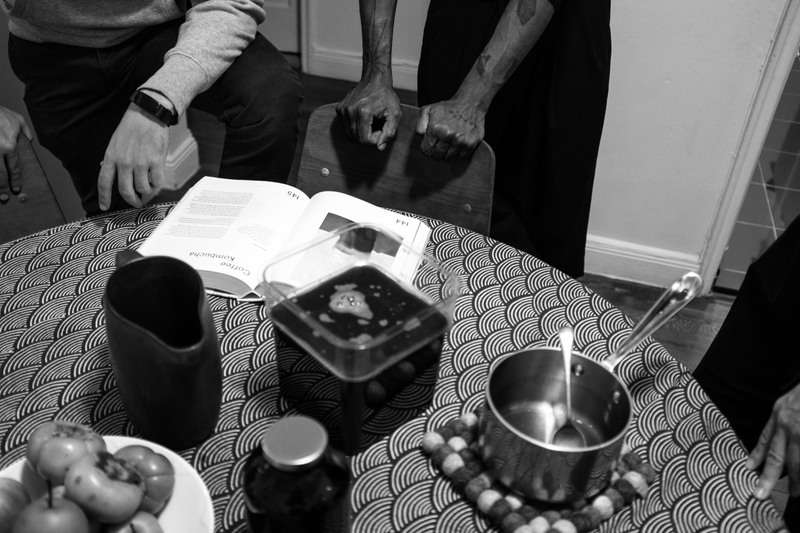 I walked him through my process, and he emboldened me further by saying that superstitions that people have around their fermentation process can be streamlined. “Sometimes fermenters tend to get very romantic about things that don’t matter,” he explained. 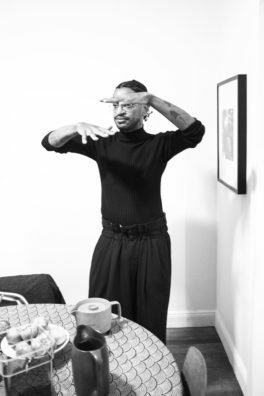 The next morning, still praise-drunk, I strained the coffee, put it in a very big jar, and added a SCOBY. A week later, I had my own taste of Copenhagen. Try the recipe and let me know what you think! And if you want a SCOBY, please contact me for a handoff. These things multiply like crazy. Excerpted from "The Noma Guide to Fermentation by René Redzepi and David Zilber" (Artisan Books). Copyright © 2018. Photographs by Evan Sung. Illustrations by Paula Troxler. Bring the sugar and 240 grams of the water to a boil in a medium pot, stirring to dissolve the sugar. Meanwhile, put the coffee grounds in a nonreactive heatproof container. Pour the hot syrup over the coffee, then add the remaining 1.52 kilograms water. Let the coffee mixture cool to room temperature, cover, and transfer to the fridge to infuse overnight. The following day, strain the coffee liquid through a fine-mesh sieve lined with cheesecloth into the fermentation vessel. Backslop the infusion by stirring in the 200 grams unpasteurized kombucha. Wearing gloves, carefully place the SCOBY into the liquid. Cover the top of the fermentation vessel with cheesecloth or a breathable kitchen towel and secure it with a rubber band. Label the kombucha and set it in a warm place. Leave the kombucha to ferment, tracking its progress each day. Make sure the top of the SCOBY doesn’t dry out; use a ladle to moisten it with some of the liquid, if necessary. Once you’re happy with the flavor of your kombucha—probably between 7 and 10 days from the start—transfer the SCOBY to a container for storage and strain the kombucha. Consume immediately or refrigerate, freeze, or bottle it. Coffee-Kombucha Tiramisu: The next time you’re having a dinner party, make a tiramisu, using coffee kombucha in place of coffee to soak your ladyfingers. Tiramisu is quite rich and sweet with custard, and the pleasantly vibrant bite of coffee kombucha acts as a perfect counterpoint. Parsnips Glazed with Coffee Kombucha: Let’s say you’ve got a pan of peeled and quartered parsnips, caramelizing gently in foaming butter on the stove. Two minutes before removing them from the pan, throw in a sprig each of sage and thyme, turn up the heat a bit, and deglaze with about 120 milliliters coffee kombucha. Swirl the pan, paying attention as the mixture thickens and begins to stick to the parsnips. At the last minute, add a big spoonful of butter and allow it to melt and glaze the parsnips. Remove from the pan and finish with a sprinkling of smoked salt.